While we were enjoying our last two weeks of winter break, Swarthmore’s winter teams were on campus training for the remainder of their season. With a little less than three weeks of the regular season left, these four teams have a lot to do before conference play. Women’s basketball has six games left in their season, with their final game on February 13th at Haverford. Even though they most likely will not have a chance at post-season play this year, with their current record of 1-14 in Conferences, they still are making the best out of their remaining three weeks left to play. Lizzie Stiles, a junior guard who currently leads the team in scoring an average of 8.9 points per game, shared her team’s goals for these last three weeks of their season. “We’ve discussed this a lot as a team since we don’t have much of a chance at post-season with our losing record. We’ve really arrived at the conclusion that we have to keep going and play for each other. We’re looking to have fun and see every day as an opportunity to play the game we love,” said Stiles. While the team might not have a chance to make the Conference playoffs, they still do have other milestones to look forward to. Like Senior Day, which is this Saturday against Gettysburg at 1:00 p.m., where the team will be celebrating their one senior and captain, Audra Woodside. Men’s basketball, currently ranked No. 17 in the D3hoops national poll, is once again on the road to play for another Centennial Conference Championship. Over break the team played eight games, five of which were against teams in their conference, and came away with a 7-1 record. Over winter break, the team also extended their winning streak to 10 wins in a row, which is the longest winning streak in Swarthmore men’s basketball history since 1940. Zac O’Dell ’20 was awarded Centennial Conference Player of the Week after his outstanding performance against Middlebury. During that game he led his team in scoring with 25 points, his highest total of the season, in the 28 minutes he played. Their current conference record of 9-3 has Swat men’s basketball positioned No. 2 in the Centennial Conference standings, behind only Johns Hopkins who has a current 10-2 record in Conference. With six games left in their regular season these rankings could change, especially if Swarthmore can beat Johns Hopkins in their last regular season game against them next Wednesday at Tarble Pavilion. Having only lost by three points during their last faceoff with Johns Hopkins, this could be another good game with hopefully a better outcome for Swat. Men’s basketball’s next home game is this Saturday against Gettysburg at 3:00 p.m.
Women’s swimming, with a record of 4-1 in Conference Meets, is hoping to get themselves back into the Centennial Conference Championship, where they placed second last year, their best finish since the 2008 season. Some key returners who played pivotal role in last year’s success and continue to do so this year are Hannah Kloetzer ’21, who won the 1,650-yard long distance race. Liz Staton ’19 and Sophia Lee ’21 placed in the top eight of the 20 breaststroke and Hyeyun Chae ‘21 finished fifth in in the 200 back. These athletes, along with the rest of their team, were able to achieve the team’s best finish in the last 10 years and look forward to come back into Conferences this year and take first place from the defending champions, Ursinus. Currently ranked No. 2 in the Conference Standings it looks like another championship run is in their future and their training over winter break allowed them to prepare themselves for this endeavour. The team ended their break with a 10-day training trip to Puerto Rico that left the team with a renewed hunger to win. During these 10 days the team had 15 practices allowing them to come back to school in even better shape than when they left. Dani Gomez ’22 shared her thoughts about her first ever training trip. “I think our training trip really did the best to prepare us for our conference championship which is coming up at the end of February. As a team we really grew because we were able to excel under really tough circumstances and some really challenging practices. Even if we don’t complete our goals of conference it is not for a lack of trying,” said Gomez. Men’s swimming also had the luxury of spending their last week of break in Puerto Rico as they, too, trained with the goal to win Conferences this year, as they did two years ago. Last year they were defeated in the Championship despite winning all their head-to-head meets during regular season. Although they did not come away last year with a championship they did finish in second place. Alec Menzer ’21 received the Outstanding Rookie Performer award at the end of the meet, after winning the 200-meter fly and setting a new conference and championship record with his time of 1:51.88. Michael Lutzker ’19 won gold 1,650-yard freestyle by an entire lap and Jeffrey Tse ’19 placed second in the 200-meter backstroke. With these key returners as well as many others, Swarthmore men’s swimming seems to be in a good spot going into Conferences this year, especially with their current 4-0 record giving them the number one spot in the Conference standings. Over break they competed in three non-conference meets, of which they won two, and Jeffrey Tse ’19 was awarded his fourth Centennial Conference swimmer of the week honor. They have two more Conference Meets before the Conference Championships, which take place from February 21 till the 24. Their next home meet is on Saturday, February 2, at 1:00 p.m. against Dickinson. 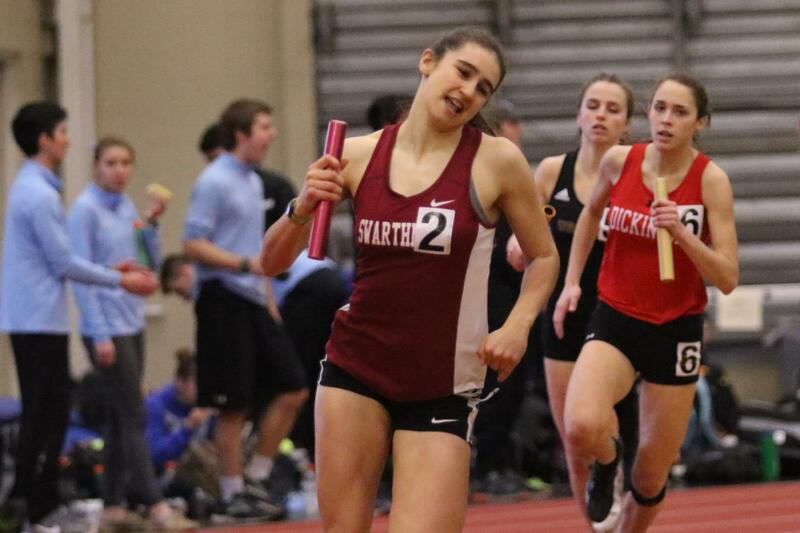 Swarthmore’s men’s and women’s track and field team competed at the Coach I Open hosted by Franklin & Marshall over winter break. Jared Hunt ‘19 broke his own Swarthmore school record with a 50 ft 8.75 in. throw in the shot put, winning him first place. Daniel Belkin ‘19 also took first place in the high jump and currently is ranked No. 13 Nationally in Division III. Three other male Swarthmore athletes took home metals including Vaughn Parts ‘20 for his second place finish in the 3000-meter run, Alex Flowers ‘21 with his second place finish in the pole vault, and Robert Eppley ‘19 who came in third for the 60-meter hurdles in 9.00 seconds, which is a new Swarthmore record. 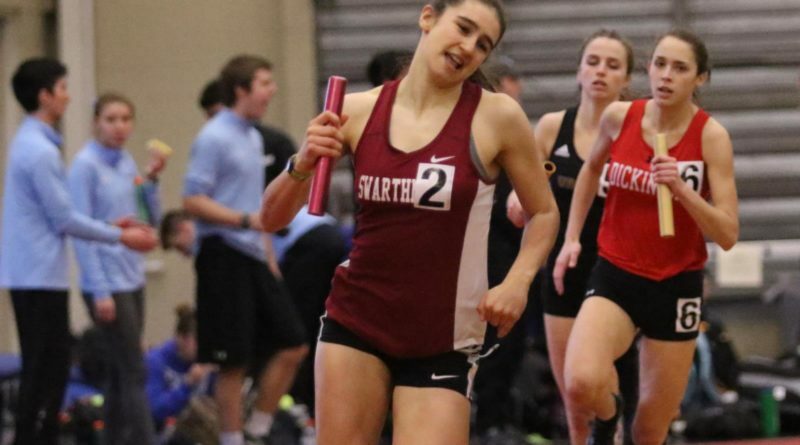 For women’s track and field Sydney Covitz ‘20 took home the first place metal in the 400-meter dash and Naomi Bronkema ‘20 took third place in the high jump. Both teams have four more meets before the Centennial Conference Championships on the weekend of February 23. Last year the women’s team was able to finish second in the Conference Championship Meet, which was the best result they have had in the past 20 years. The men’s team finished third, behind only Haverford College and Johns Hopkins University. Despite the weather turning cold, these teams seasons have continued to turn hot as they all push towards their respective Conference Championships. With less than a month left, the Garnet look to finish the year strong with more exciting performances. Elizabeth '19 is majoring in economics and history. She is a member of the softball team and enjoys writing for the sports section of the Phoenix.